﻿ Ari Putri Hotel, Bali | FROM $24 - SAVE ON AGODA! "Close to everything very quiet area, excellent Bali style ga..."
Have a question for Ari Putri Hotel? "This little hotel was great." "The room is in good condition and clean." A stay at the Ari Putri Hotel will make your Bali vacation much more memorable and enjoyable. The rooms at this hotel offer pool and garden views for guests to enjoy, so you are bound to be peeking out at pleasing scenery. The hotel is close to Sanur Beach, Hardys Sanur Shopping Square, Turtle Conservation and Education Centre, Virgin Beach, and Sector Golf Bali Beach. It offers a bar, a poolside bar, room service, a coffee shop, and restaurants on the property, so there is a selection of dining and snacking choices. With tours available, the Ari Putri Hotel is a great place to stay to learn about the area and see everything you can while you're here. At the incredible massage facilities, you can spend a few hours treating yourself to some pampering. The Ari Putri Hotel has a golf course, a fitness center, a spa, a garden, and an outdoor swimming pool among other great facilities. The hotel has air conditioning, so you'll have everything you need for a comfortable stay. It features a kids swimming pool, so there's no need to stress about your little ones swimming in the deep end. This hotel has several convenient features, such as a salon, a currency exchange, and safety deposit boxes. The Ari Putri Hotel provides a variety of useful services, which include a concierge, laundry services, luggage storage, as well as dry cleaning services. There's free Wi-Fi in all rooms, as well as Wi-Fi in common areas, so visitors won't have to spend money on buying a local sim card. The Ari Putri Hotel features a front desk that's open at all hours, ensuring that there is always someone on call to help you. This hotel has a range of transportation options that include airport transfers, shuttle services, bicycle rentals, and car rentals. Bemo Kreneng Bus Terminal is 6.7 km away and Tegal Sari Bus Terminal is 7.4 km away. The nearest airport is Ngurah Rai International Airport (DPS) which is situated 30 min away. Check-in is offered from 02:00 PM and check-out is until 12:00 PM. "Location is good, close to all bars and restaurants, beach i..."
I have stayed at the Ari Putri four times and will stay yhere again. Its a very popular place especially for older tourists. The breakfast is in with the price and offers a good rabge of food from fruit, eggs, to fried rice etc. The staff a very friendly and helpful. The street side restaurant is also very popular and offers a good range of food and drinks- plus live music. A lovely hotel... not new or even modern which is its charm. Doorway with Balinese wood carving , many touches of old Bali through out.. even real door keys - no electronic card. 10 minute walk to beach. Several good restaurants in area as well as the hotel itself... very friendly and helpful. AND very quite. Great bed and large room. Does not seem a young peoples hotel but that to was good! My stay here was wonderful. I arrived at around 1:30 in the morning due to my flight. The hotel had someone help with baggage to my floor. Each room has a balcony and adequate facilities. The pool and hotel is gorgeous and clean. Excellent location close to the beach. The staff were very helpful and friendly - the kind lady helped book my ferry transfer and pick up . I didn’t tip but I left a brand new knapsack with note for the staff to keep it or throw it away and the staff still tried to return my unwanted bag. Once the porter understood he had a big smile on his face. I guess he really liked my knapsack. Breakfast was pancakes, waffles, poached eggs, and fruit. Basic but filling. I would stay definitely stay again. I have stayed here 4 times and it never dissappints. Good breakfast, very good and friendly staff. The restaurant is excellent and very popular with the general tourist piblic. This little hotel was great. Clean budget accommodation in a great location.You have everything you need close by and don’t have to walk far to restaurants, spas, shops, laundry, it’s all right there. Lovely pool and breakfast. Friendly staff. I would definitely stay here again. The place is in good location. Built in 1998 in a Royal Balinese style. The hotel has an old s new wing. If you stay in old wing you will be very disappointed with the condition of your rooms, grey bedsheets and pillows with bugs. It is very old and over used :( Though, if you stay in a new wing (double cost) you will be very satisfied. Therefore the rating, in my opinion, cannot reflect the true condition of the hotel. So...if you can afford, book a Delux room and enjoy your stay. Must try the SPA - one of the best SPA in entire Sanur! Restaurant / room service - cheap. But new chef is not as good as before. The food is very basic... Nice pools! Great architecture! Family business. Please have your old rooms renovated.... and we will return! The location is key, Jalan Cemara, Sanur is a leafy one-way street with several nice restaurants and bars either side and light and slow traffic (it can be a relief!). The hotel's restaurant is excellent and you can order at the front and they will bring food around by the pool if you want, tasty and cheap. The room was basic, but ok. The only down side was they had no hot water (for a shower) in the full 3 days we were there, that makes it a budget hotel for me hence only 2 stars for facilities. The pool area was nice. I would recommend this hotel. Have stayed at Ari Putri many times and have always had a great experience. Everyone is oh so friendly. Breakfast is excellent with plenty of choice and is cooked whilst you wait. Absolutely recommend Ari Putri to everyone. Cons are very common to Bali: mold smell in room and crappy Internet. German tourists smoking like right next to me and my 1 year old at breakfast. Pros: very good food, we ate 80% of food at hotel as it was as good or better than every other place near. Well priced food also. Pleasant staff, clean facilities, nice enough pool, not noisy, 5 to 10 min walk to beach, room, shower and toilet all decent and working properly. I've stayed at this hotel before in the Deluxe Rooms and loved it. This time they were booked so I stayed in the Standard Rooms and I was equally happy. Two excellent pools, good food, superb restaurant out the front (with live music while we were there), clean and central to everything. The only draw-back is that it's not on the beach or with any view, but It's probably only 10 minutes walk to the beach (one of the most vibrant stretches of beach in Sanur). Great value. The staff this time around seemed a bit jaded, but they were still pleasant. Ari Putri never fails to please. As an economy hotel it is very good. My standard room was good with the exception of the shower which was very ordinary, taking ages to heat up and the shower head was very old and tended to shoot water in all directions. I could put up with this. Breakfast was great with the new arrangement and extended balcony area. Staff are lovely and I really enjoyed my stay. 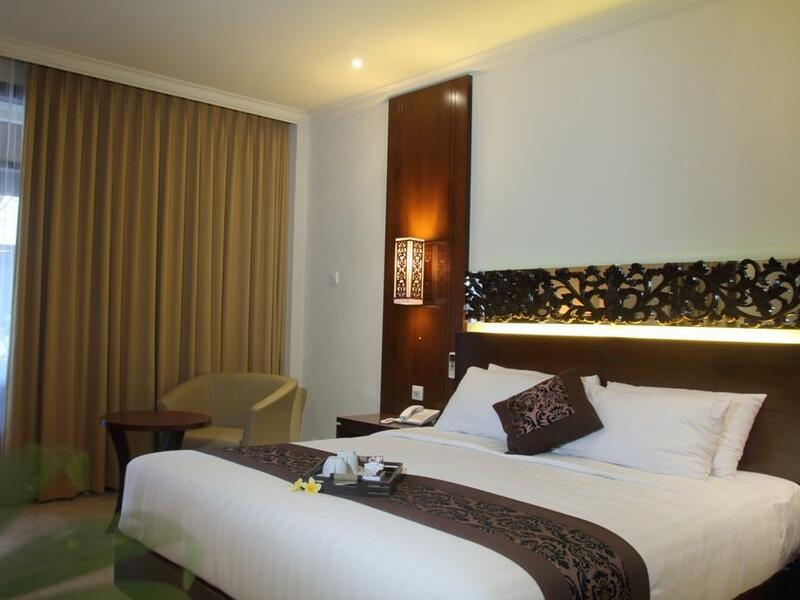 Ari Putri Hotel is located quiet end of Sanur. The hotel grounds are beautifully decorated with massive stone carvings and lush plants, which gives a very traditional and authentic feeling of Balinese arts and culture. During our holidays, we really enjoyed our stay at this hotel. Our room was big and airy. The location of this hotel in Sanur was easy to find and within walking distance of good restaurants, shopping and the beach. We found all the staff were very friendly and ready to help. The breakfast was a good quality with a varied selection of different foods. The restaurant food in the evening and by the pool was excellent quality and very good value for money. The air con worked well and was not noisy - everything in our room worked well. We were very very happy with this lovely hotel in Sanur. During our stay we met the owner of the hotel Mrs. Agung Mas Partini who always ready to help all her guests with a big smile...she is very sweet too. Our special thanks to 2 other front office staffs Mr. Ngurah Darma and Ms. Made Indari. Overall our experience at this hotel was very and we recommend this hotel to others.